If you haven’t heard yet, Aryelle over at Horse Hack is having a fun blogging contest, and yours truly is up for contention today! Head on over and vote (preferably for me, but follow your heart), and stay tuned for the rest of the contest over the next few weeks. Also, thank you times a million for all your awesome suggestions on my wishlist last week! I was out of town for the weekend so I didn’t get to respond to everyone, but I SO appreciate the time and thought you guys gave and am taking all your suggestions into consideration for sure. Manfriend has informed me that he’s cooking up a new post for y’all, which should be at least as hilarious as his last chime-in. My super awesome amazing Daddoo is also coming down for a visit in November, and I’ve already planted the idea of him guest posting as well! Please help me pressure him into writing for me. C’mon Daddy, don’t you WANT me to be happy?! Despite my show hiatus, this fall is ramping up to have all sorts of fun adventures that I can’t wait to share with you! And as always, let me know if there’s any type of post you’re really feelin’ or want to see. Ask and ye shall receive. I hope all youz guyz had an absolutely fantastic long weekend! Or if you’re like manfriend and had to work yesterday, I hope you had an absolutely fantastic regular-length weekend! I was lucky enough to ride for three days in a row and it was AWESOME. And I will tell you why. It is because two of those rides were on Addy, and she’s so awesome blah blah blah I love her so much etc. But the other was on another horse. To be exact, on Courtney’s (from Vintage Virginia) horse. I’ll give you a minute to go check out her blog right now- she’s got really cute horses, does cool projects, and has a kickin’ sense of style. In short, she’s awesome. You may remember that a couple weeks ago I mentioned that trail rides totally freak me out and I very much like to be contained by a fence. 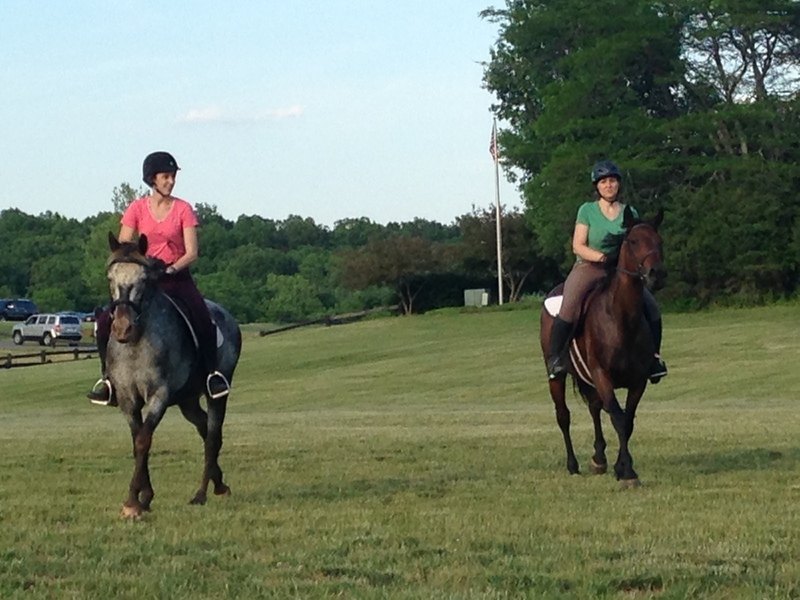 Courtney, being totally baller, invited me out to ride one of her ponies at a park nearby! We both brought our menfolk just in case one of us was the Craigslist killer, but luckily there were no murder shenanigans. 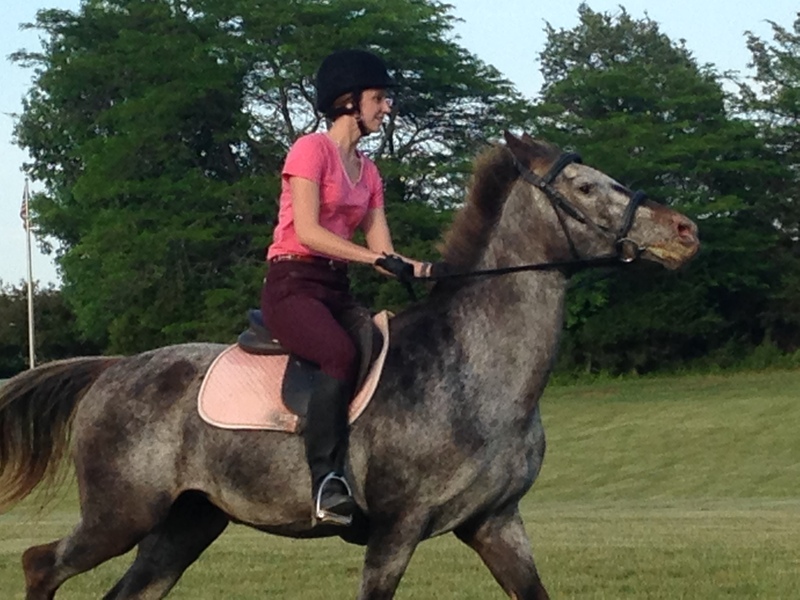 Let me just say that this girl has some fantastic horses. We went and played around in the ring for a while, with me riding her wonderful Appy Vintage and Courtney on her 6yo baby Berry. So cute! Vintage was such an old pro and handled me flopping around without flicking an ear. We popped over a crossrail a couple times, and even hopped over a vertical! 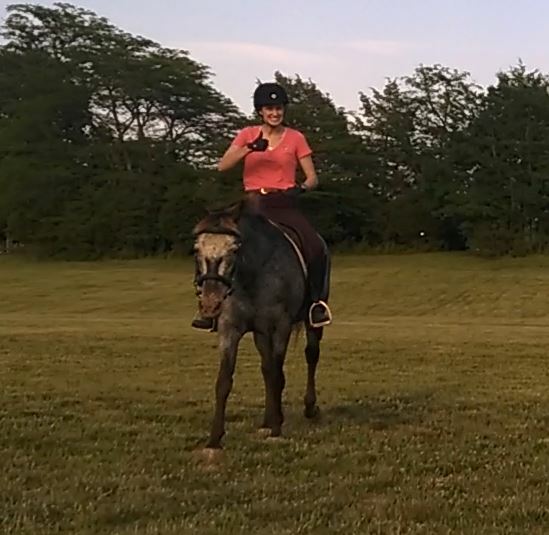 It was sooo weird to be on a horse that wasn’t Addy- I haven’t ridden any other horses since last September. 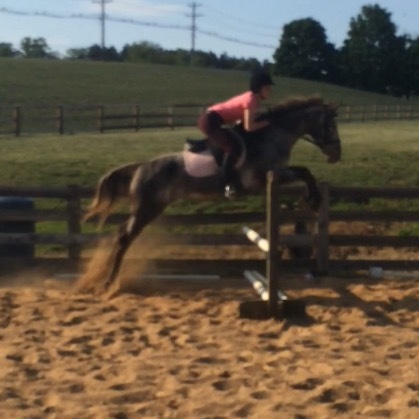 Vinny doesn’t idle at a hand gallop and actually required me to use my leg for speed. But little pony had the smoothest canter! Seriously, it was like gliding around the ring. I fell in love with her almost immediately. Then it was time for actual trail riding! Turns out that James Long Park has pretty extensive trails, and we took full advantage of them. (If you’re in the northern VA area I would definitely recommend heading out here, it was awesome!). This was one of Berry’s first outings this year and she handled it all so well. Vintage, being an amazing horse that I love, was an angel and took me through the woods and up and down hills without any problems. It was super fun to get to chat with Courtney and bond over horses with a new friend! 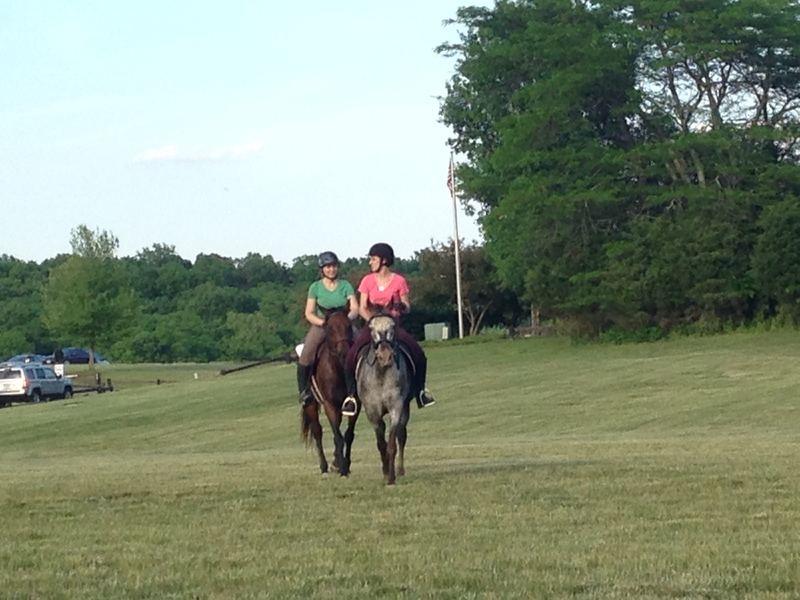 Since the horses were so well behaved, we were able to just relax and enjoy a beautiful day. Once we emerged from the woods, we were on the opposite side of the park from where the trailer was parked. 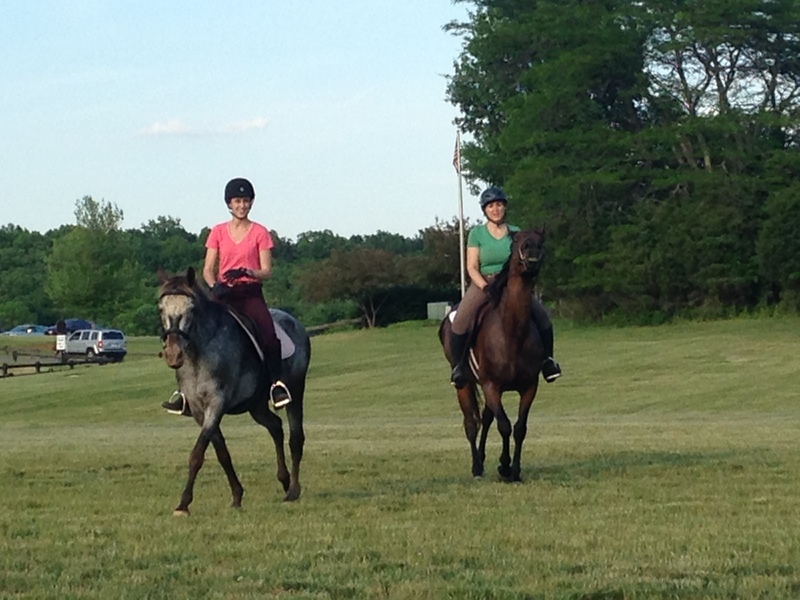 So we decided to give the horses a little canter stretch across the beautifully manicured flat grass. Turns out that the reason it was so flat and nicely manicured is because it was a soccer field and I think we weren’t really supposed to ride on it, buuuuuut come on people. Perfectly smooth ground. Tell me you wouldn’t have done the same thing. The trailer was parked in a field so we decided to do a couple more laps running around before cooling out. Yeehaw! Little Appy had mad ups, she really kicked it into a higher gear! This coming from a trail-riding-weenie: this pony took such good care of me that I didn’t even get nervous running around in a field. It was awesome! It actually made me realize why people get so exhilarated on cross country. Berry seemed to have a blast running around too, and both horses wanted to keep going when we walked to cool them out. Vinny leading the way and Berry saying hi. Never fear, we did not forget about the menfolk. Turns out they’re both huge movie buffs that greatly enjoy guns, so I don’t even think they noticed when we left or came back. We both had to holler a couple times to get their attention. Today is a very special day, Dear Reader. If we were in high school, you would likely be getting me flowers and I would be posting all over social media that you’re my favorite reader and we’ll be together forever. That’s right. 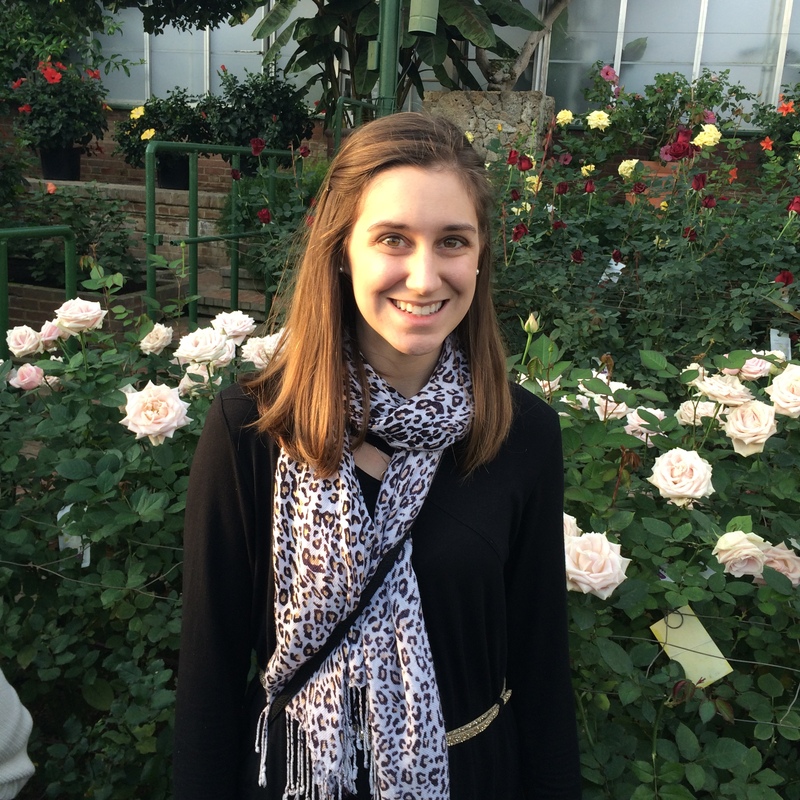 It’s my monthiversary as a blogger! And the 23-year-and-change-iversary of smiling awkwardly for pictures! I was admittedly a little nervous about starting this blog- I’ve never been a talented writer, and my creative streak is about a millimeter wide. I’ve also been pretty sure that no one particularly wants to hear the ramblings of someone who very clearly doesn’t have it all figured out. But the feedback I’ve gotten has been so super encouraging, and I’m feeling more and more confident about this whole venture. Thanks to you, Dear Reader! Whether you’ve followed me all month or are just joining in, I can’t wait to hear your thoughts and share a little bit of my life with you! I’ve had a fantastic start to my blogging journey, and I can’t wait to keep connecting with all of the awesome people here. But to wrap up my first month here, I’m actually going to turn this around on you, my lovely readers. I’d love to get your feedback so that future months are more interesting, more useful, and even better than this month has been! What do you want to see more of? Anything you’d like to see less of? What’s really working or not working for you?